Abbington Green Bed & Breakfast Inn, Asheville NC: Asheville Bed and Breakfast Agrees, " No Price is Set on The Lavish Summer..."
Asheville Bed and Breakfast Agrees, " No Price is Set on The Lavish Summer..."
"No price is set on the lavish summer; June may be had by the poorest comer." So said the poet James Russel Lowell in 1848 in the poem "The Vision of Sir Launfal". 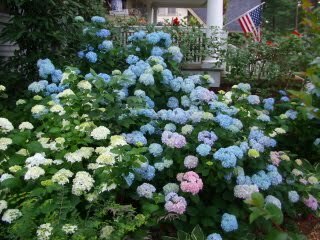 June, a month of great summer beauty in our Asheville bed and breakfast gardens... June, the month of hydrangeas. 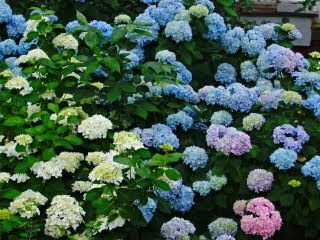 If you know these plants, you know that if they are happy, they produce great profusions of large flower clusters of blue or pink or white. This June, they've gone wild...in the best way imaginable. Large, healthy and so many flowers. And the blooms can be brought inside to make lovely arrangements. Or, they can be dried to make beautiful but quite sturdy arrangements to use at any time of year. 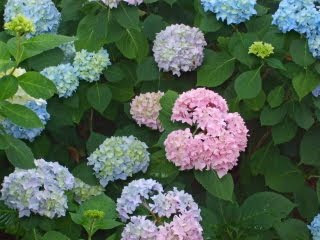 Our Asheville bed and breakfast gardens are looking like 'ground central' for hydrangea varieties. Come experience our "bit of Britain close to home" and some of this wonderful, "lavish summer"!